Rent villas and apartments in San Feliciano, Italy with private pools. Book affordable holiday rentals that are near a beach and golf course. Pleasant holiday house in a lightly hilly position with a covered, equipped terrace and lake view. Bright living room with open fireplace and tasteful furnishings. Various terraces. 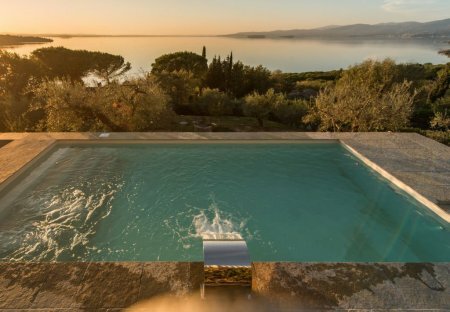 Holiday house, 3 km from San Feliciano at Lake Trasimeno. The house extends over two levels, these are connected by internal and external staircases. It is surrounded by a garden. This 3 bedroom apartment is located in San Feliciano and sleeps 6 people. It has barbeque facilities, parking nearby and a gym. Comfortable cottage by the lake, with swimming pool and private tennis plots. On the ground floor is a large living room with fireplace and terraces. 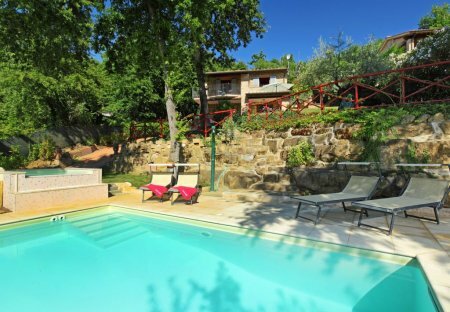 This 3 bedroom villa is located in San Feliciano and sleeps 5 people.